DHAKA: Business executives from global clothing giants H&M Inditex and Gap have cancelled trips to Dhaka this month after the killings of two foreigners, industry sources said, causing anxiety for Bangladesh’s $25 billion garment export sector. Bangladeshi suppliers to the world’s top brands said they didn’t expect the disruptions to hurt their orders for the year-end Christmas season. But the attacks, claimed by the Islamic State, increase the pressure on an industry which faces competition from other low-wage countries and is trying to repair its safety image after several fatal accidents. The United States and Canada have asked their diplomats to restrict their movements, and Britain warned of more attacks after an Italian aid worker and a Japanese man were shot dead a few days apart. Australia cancelled a cricket tour. Bangladesh’s government, however, rejected the claim by the Islamic State and blamed the growing violence in the country on its domestic political opponents trying to show it in poor light. The attacks on foreigners, while rare, follow the killings of four Bangladeshi bloggers this year by machete-wielding assailants, and have spawned fear among the foreign community. “Our Western buyers panicked after the killing of the two foreigners within five days. Some buyers cancelled their visits during this peak time when they are supposed to place more orders,” said Siddiqur Rahman, chief of the Bangladesh Garment Manufacturers and Exporters Association. Shahidullah Azim, a garment exporter who supplies to Sears , Loblaws and Perry Ellis among others said one of his buyers asked him to come to Dubai instead, along with the clothing samples. Other foreign business executives asked for video conferences with their Bangladeshi counterparts, saying they couldn’t travel to Dhaka because of the warnings issued by their governments. “We are monitoring the situation in Bangladesh closely and we are taking the appropriate security measures. We are also in close dialogue with other brands regarding the situation,” H&M spokeswoman Anna Eriksson said. Marks & Spencer said the firm stopped travel to Bangladesh for seven days a few weeks ago. Travel has since resumed, a spokeswoman said, and added there was no impact on business orders. Gap declined to comment on a change in its travel plans. Tesco said it had not stopped business travel to Bangladesh, but had asked its employees to be vigilant and consider their movements carefully. Japan’s Fast Retailing, which owns the Uniqlo casual wear brand, said it suspended business travel for Japanese employees to Bangladesh this month, and warned employees against going out alone except when necessary. It said its local stores were operating as usual. Bangladesh has deployed paramilitary soldiers on nighttime patrols in the diplomatic quarter of Dhaka and issued a nationwide ban on people riding pillion after the two attacks were carried out by masked men riding bikes. Home Minister Asaduzzaman Khan, who has dismissed claims that the Islamic State was operating in the Muslim majority country of 160 million, said on Wednesday that police were close to a breakthrough on the killings. “We have taken these attacks very seriously. We won’t spare the killers,” he said. Prime Minister Sheikh Hasina has blamed the rising tide of violence on the opposition Bangladesh Nationalist Party and its key ally, Jamaat-e-Islami, many of whose leaders are being prosecuted for war crimes during the 1971 war of independence. The opposition denies any involvement. 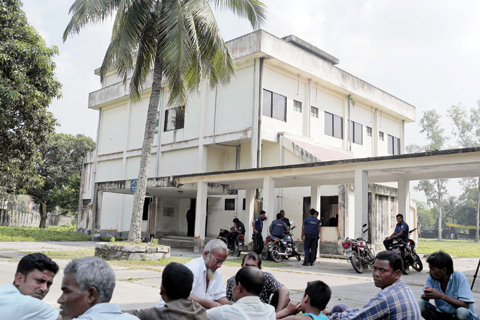 A Dhaka-based garment manufacturer said the government had increased security in the area where foreigners lived, police had spoken to them and confidence was returning. Business was strong, but if there is another attack on a foreigner, it could hurt the sector.